Record have a long and respectable history of producing great workshop kit, and they have now updated their line-up of bench-mounted disc sanders with the DS300. 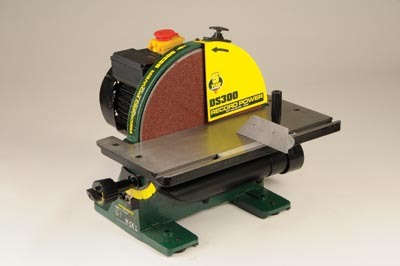 The bench mounted disc sander is one of the most useful machines you can have in any workshop. It is amazing the number of times you have to pop over to the machine just to tidy up a job, whether it be sanding off a curve so it's just so, or even sharpening a pencil, so making the right choice when buying can save you lots of grief in the long run. First impressions of Record's latest are, as you would expect, favourable. It's a heavy beast and took some lifting out of the box and onto the bench. The Record green of the cast iron base and fittings contrasting with the yellow of the sander guard, speak of the usual Record solidity. But what of the machine in action? The first thing I like is the guarded on-off switch being mounted on top of the machine, which means no bending over and peering around the corner to find the on-off buttons. The worktable is solid and can easily be tilted by a gears' knob, which you unlock with a wing nut then turn to get your required angle. The protracter has detents at 90 degrees, 45 degrees and 22.5 degrees to make it easy to locate the table at the required angle. The mitre fence slides easily in and out of its housing and runs true. A sub-fence would be well worth fitting to more easily hold a workpiece against the mitre fence. The protractor on the mitre fence is a little bit of a letdown after the effort Record have gone to with their geared worktable protractor, as it has no detents to locate at the commonly used angles, but this is a minor consideration. 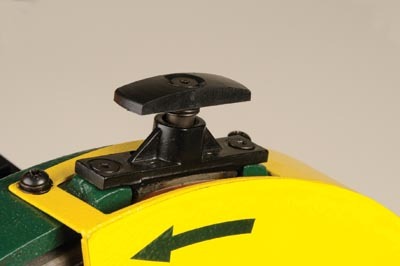 The sander also has a brake fitted to the guard, which is very helpful if you need to stop the disc very quickly. The motor has such good bearings it runs for an age after switching off. Extraction works very well and is probably aided by the guard on the face of the sander which stops the unwary using the up side of the sanding plate. You can't really go wrong with this high quality bit of kit. The nice little touches such as brake for the sanding disc, and geared worktable mechanism, as well as a top mounted switch, make it a joy to use. And, of course, the machine does all the basics very well. So you can't go wrong with this fellow.